GREENE COUNTY — Breathing is a very natural activity—and so is getting out of breath when you run. When you run, you may get out of breath. This is normal. This is natural. Your body runs on oxygen, just as your automobile runs on gasoline. When you start to exercise—whether running, walking or any other physical activity—your muscles need more oxygen. The body meets this need by supplying oxygen-rich blood to the muscles. The lungs work harder to absorb this oxygen out of the air. Without giving it much conscious thought, most runners breathe in a 2/2 rhythmic ratio. They take two steps as they inhale; they take two more steps as they exhale. While running very slowly, they often breathe in a 3/3 ratio. While running very fast, they might breathe 2/1, or 1/1, but 2/2 is much more common. If you count breaths in and out and discover you are breathing with a different rhythm, don’t worry about it. Adjusting your breathing pattern will not make you a better runner. Your jaw should be relaxed, your mouth slightly open. The oxygen will come through your nose and mouth to your lungs, to your blood and to your muscles without you needing to give it a lot of thought. Breathing is a very natural activity—and so is getting out of breath when you run. Day 1: Jog ½ mile (or 5 minutes) Jog 1 mile (or 10 minutes Jog 2 ¼ miles or 25 minutes with no walking, Walk ¼ mile (or 3 minutes) Walk ¼ mile (or 3 minutes). Day 2: Jog ¾ mile (or 8 minutes) Jog 1 mile (or 10 minutes), Walk ¼ mile (or 3 minutes). Day 3: Jog ½ mile (or 5 minutes). Training Tip brought to you by www.coolrunning.com. Adapted from: www.runnersworld.com Author: Hal Higdon. Be sure to check out next week’s article that will feature another helpful tip from Greene County Public Health. If you would like to register for the 5K scheduled for April 14 at the Xenia YMCA, go to www.speedy-feet.com or print and mail a registration form with your payment by visiting www.gcph.info. 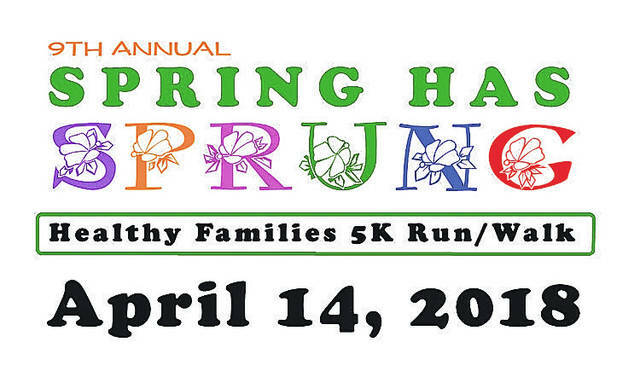 Register by April 6 to get your free event T-shirt. For more information or to be a sponsor call 937-374-5683 or email jdrew@gcph.info.